Hello, I’m Jim Glover, That Branding Guy, for Once a Day Marketing™. On our radio show That Branding Guy™, we discussed branding and marketing with the founder of a non-profit dedicated to veterans. Joining us on the show was Rob Jones – Founder of Rob Jones Journey, a non-profit organization dedicated to raising money for wounded veterans. His overall goal is to raise $1 million. Rob has accomplished two major feats to raise awareness for this cause, his inspiration comes from setting challenges for himself. His first fund raising effort was Rob Jones Journey, in the winter of 2013-2014, Rob rode his bike across America raising money for wounded veteran charities. Then in the fall of 2017 Rob completed the Month of Marathons – 31 marathons in 31 consecutive days in 31 different major cities in America and abroad. Through these efforts Rob is sharing his story of a veteran who came back from overseas and is making a difference in people’s lives. 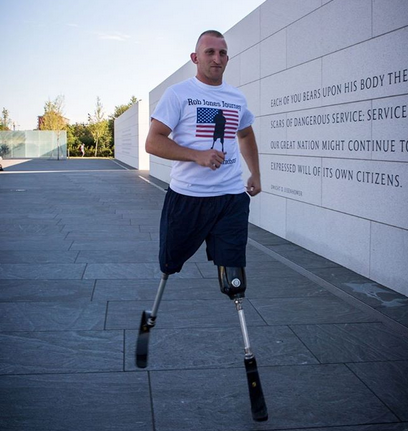 Although his goal is to inspire veterans and others through sharing his accomplishments, Rob is inspired by all the people who came out and joined him during his marathons. To publicize his Month of Marathons, Rob engaged a PR firm and his wife Pam assisted him in contacting individuals in their network to share a press release Rob created about his mission. Donations and number of people running along with Rob let him know how successful their media campaign had been. That Branding Guy made a suggestion that Rob expand the story of his mission on the Rob Jones Journey website and also update social media pages to reflect his accomplishing the Month of Marathons and add a call to action. Tweeting once a week about something that inspires him would also be a great way to keep Rob’s brand top of mind with followers. © 2018 Once a Day Marketing™. All rights reserved. Contact us now, we would love to work with you. Enter your email address to receive our latest blog. Submit your branding or marketing question to James Glover. Connect with our branding and marketing community. Explore our 250+ branding and marketing videos. Follow our updates, announcements and appearances. © 2019 Once a Day Marketing. All rights reserved. Another project by Cirrillian.